"A new history begins now - at the starting point of an era of peace." Panmunjom, a truce village straddling the heavily fortified inter-Korean land border, captured the global spotlight on Friday as leaders of South Korea and the Democratic People's Republic of Korea met for a historic summit. Smiling top DPRK leader Kim Jong Un was greeted by South Korean President Moon Jae-in and they shook hands right above a concrete slab on a narrow aisle between the blue pavilions inside Panmunjom, which actually serves as an inter-Korean border roughly along the 38th parallel dividing the two Koreas. 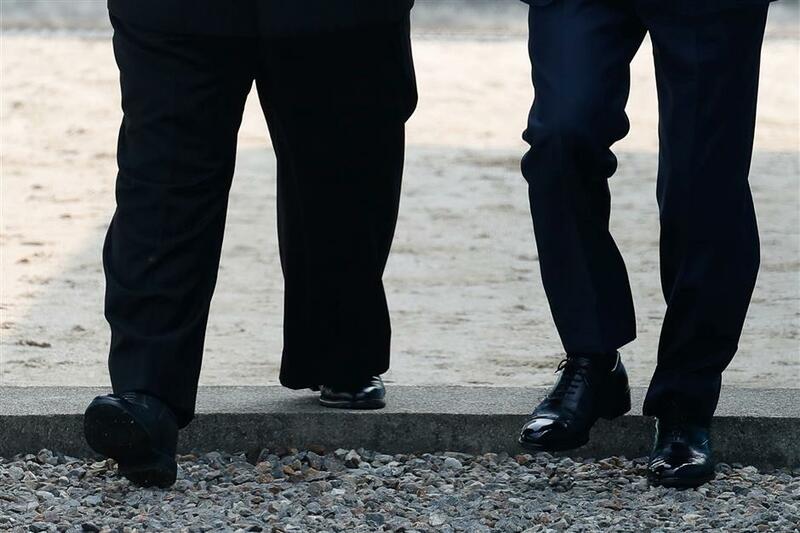 After walking across the inter-Korean land border, or the Military Demarcation Line, at 9:30am local time, into the South Korean side, Kim, in a dark blue suit, invited Moon to briefly cross the border into the DPRK side. They returned to the South Korean side of Panmunjom grasping hands with each other, marking a historic moment in inter-Korean relations. DPRK leader Kim Jong Un (left) steps into the South Korean side over the Military Demarcation Line that divides the two Koreas with South Korea's President Moon Jae-in ahead of their summit at Panmunjom on April 27, 2018. Kim became the first DPRK leader to set foot on South Korean soil since the 1950-1953 Korean War ended in an armistice. The two Koreas are technically still at war. 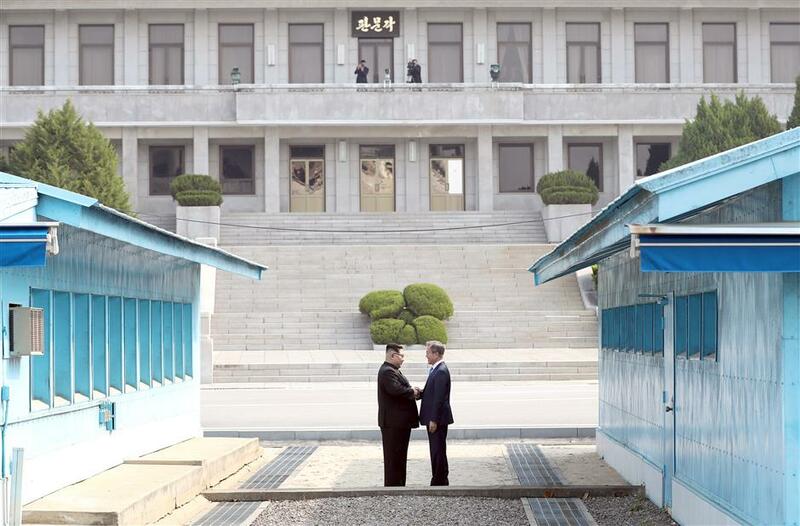 The two leaders shook hands again in front of cameras at 10:15am local time before their talks at the Peace House, a building on the South Korean side of Panmunjom inside the 4-kilometer-wide, 250-kilometer-long Demilitarized Zone. "A new history begins now - at the starting point of an era of peace," read the message Kim wrote in a guestbook at the Peace House. "The moment Chairman Kim crossed the Military Demarcation Line, Panmunjom, became a symbol of peace, not a symbol of division," Moon said before their talks. Panmunjom, located around 50 km north of Seoul, is a painful reminder of division of the peninsula as the Korean Armistice Agreement, which halted the Korean War, was signed in 1953 at a building on the DPRK side. The truce village is also the place where the two Koreas had more than half of some 660 inter-Korean talks over the past decades. In the afternoon, Moon and Kim are expected to plant a pine tree at Panmunjom, using a mixture of soil from mountains and water from rivers of both sides. The commemorative tree was sown in 1953 when the armistice agreement was signed. Engraved on a stone plaque for the pine is the phrase "Peace and prosperity are planted," as well as the signatures of both leaders. Denuclearization of the Korean Peninsula is high on the agenda of the talks between the two leaders. Kim Jung-gil, a 65-year-old Seoul citizen, said he hoped the South and North sides have more communication and exchanges of views on the denuclearization of the Korean Peninsula. "I hope the summit could push forward the process of denuclearization of the peninsula." Ending the state of war on the peninsula is forecast to be another topic after the South Korean presidential Blue House confirmed it was reviewing ways to switch the armistice agreement into a peace regime. "I'm very glad that the summit is held. I want to know how the two sides can discuss a lasting peace on the peninsula and the reunion of separated families," said Oh Sun-myeong, a 47-year-old housewife in Seoul. After their summit, Moon will host Kim with a banquet on Friday night, which is expected to be highlighted by the Swiss fried potato dish rosti, and grilled fish with rice produced in Busan, the hometown of Moon. The signature cold noodles from Pyongyang's famous Okryugwan restaurant will also be served, according to the Blue House. A chef from Okryugwan will cook the noodles with a noodle-making machine installed at Tongilgak on the DPRK side of Panmunjom. The summit came after detente between Seoul of Pyongyang before and during the Winter Olympics that ran from February to March at South Korea's eastern county of PyeongChang. It will be followed by a summit between Kim and US President Donald Trump in May or early June. The top-level meeting, under a slogan of "Peace, a New Start," marks the third summit between the two Koreas, with the previous two held in Pyongyang in 2000 and 2007 respectively. A recent poll, conducted by the Research View among 1,000 South Koreans, showed 68 percent of the respondents believe the Moon-Kim summit will yield positive outcomes. "I think through the summit the two leaders could move the divided Korean Peninsula toward reunion, and usher in a new chapter of inter-Korean exchange and cooperation," Oh said hopefully.